Dragon Dreams is a small press publishing company and design firm specializing in book publishing, needlework, graphic design and illustration. We offer a wide variety of consulting and feedback for beginning authors and illustrations striving to get their stories into the hands of readers. 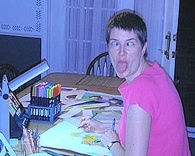 Dragon Dreams was founded in 1989 by illustrator Jennifer Aikman-Smith. In 1993, it began publishing counted cross stitch charts and wholesaling them to shops around the world. Jennifer’s needlework appeared in magazines across the US, Canada and overseas. In 2001, she helped coordinate the layout and pre-press work for A Celebration of Stitching (Krause Publications) to combat the growing threat to the needlework industry by countries such as Russia and China who had opened their Internet websites to outsiders. Publications and shops around the world began to suffer from the effects of illegal chart piracy. By 2006, Jennifer had added more illustration, graphic design and other prepress work to her workload to supplement the loss of income from cross stitch. After helping a local author and publisher illustrate and layout a children’s book for publication, she decided to expand Dragon Dreams mandate to become a small press publisher. Working closely with Riverview author, Paul Burns, she illustrated, edited and handled the layout for their first collaboration, Owen & the Dinosaur, in 2008, which has now sold over 2,000 copies. Dragon Dreams’ second book, a chapter book called Emily Finds A Dragon, was published in 2011. It was chosen as one of 20 books for the 2012-2013 Hackmatack Award list that will be read by children in grades 4-6 at participating schools around the Maritime provinces. Voting will take place early in 2013 with the Awards ceremony being held in Halifax on May 10th. It is a true honour to have our book nominated! Dragon Dreams continues to grow its mandate to produce quality products that bring the imagination to life... be it in glorious cross stitch designs, children’s books or managing summer camps to inspire the next generation of authors and illustrators. The world is too small a place if we close the door on magic, wonder and a sense that the impossible can come to life through the power or words or pictures.